Buying a pre-owned vehicle is a wonderful way to satisfy your transportation and utility needs. It is also a way to own a reliable vehicle that does not bust your budget. There is so much variety in modern vehicle brands. Being informed is the best strategy for finding the right model. Sometimes, the biggest decision involves comparing passenger cars to durable pickup trucks. 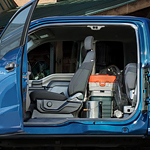 Almost as many comfort and driver options are available in today’s trucks as cars. The real issue is why you are looking for a different type of vehicle. Maybe you need extra hauling space for a move to a new city like Amherst. Perhaps, you just feel safer in a truck on a busy highway. When it comes to choosing the right used truck, forget the memories about your grandpa’s old farm truck. Today’s trucks are sleek, attractive, fuel efficient, and highly serviceable. Modern truck cabins, combined with extra-long beds, can serve as extraordinary family vehicles. Used truck experts at Virginia Select Auto can explain the differences between popular used truck designs. They can match you with the ideal truck for whatever life plans are ahead.